We’re halfway there! Can you believe it? 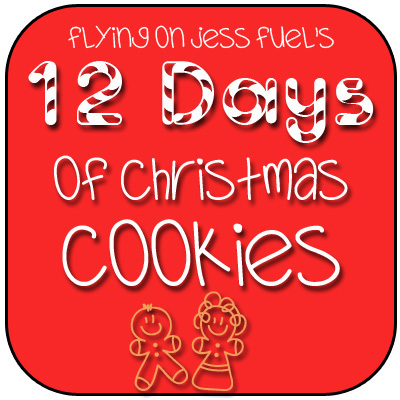 Six batches of cookies doesn’t really sound like a lot, but when you bake and eat six batches of cookies, boy is it ever! But I think I can stand to eat a few more before the season’s out. I’ve always been intrigued by jam thumbprint cookies. They’re so pretty! But they usually have some kind of sugar cookie base and let’s be serious… sugar cookies are BO-ring. Unless decorated as cute penguins and Santas and reindeer, of course. 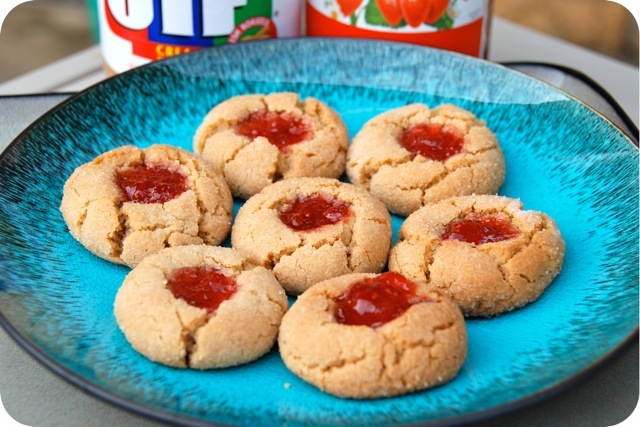 When I saw thumbprint cookies with a peanut butter base, I was in. The cookies came out amazing! Not only were they delicious straight from the oven, but every day they sat on the counter they got better and better and better! 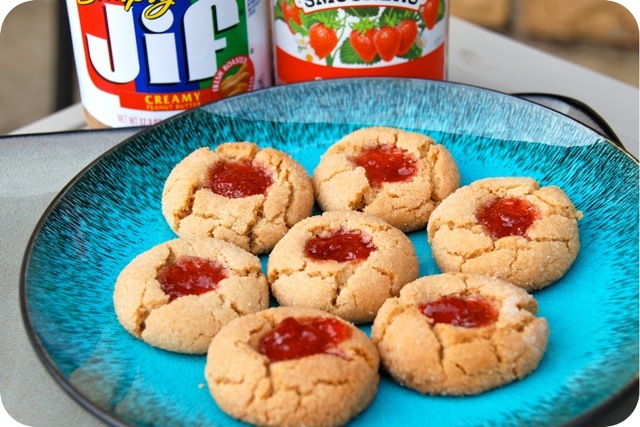 The jam soaked into the cookies and made them all moist and magical. Preheat oven to 350 degrees. In a bowl, combine flour, baking powder, baking soda, and salt. 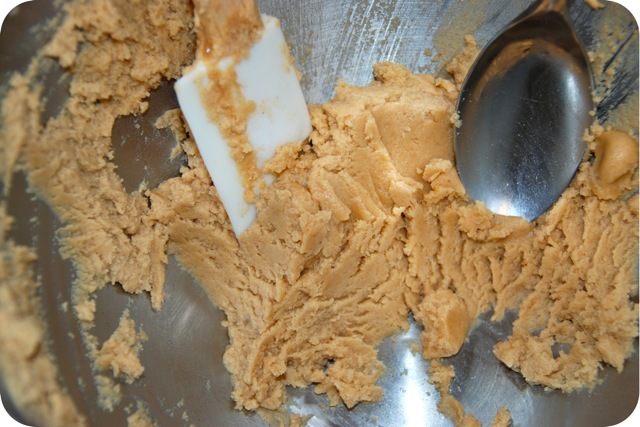 Beat peanut butter and butter together with a mixer until smooth. Add sugars, and beat until fluffy. Add egg and vanilla, and continue beating until well mixed. Slowly add dry ingredients, and mix until combined. 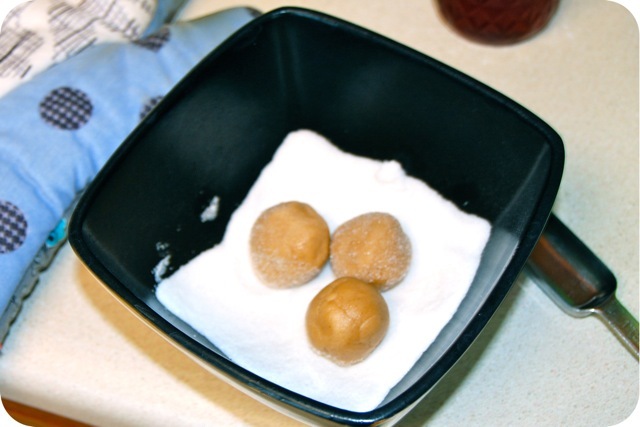 Roll tablespoons of dough into balls, and roll each ball in sugar, then transfer to parchment or silpat-lined baking sheets. Bake until cookies are puffy, about 8 minutes. Remove from oven, and make indentations in centers with a small spoon (I used a 1/2 teaspoon measuring spoon). Return to oven, and bake until edges are golden, 5 to 6 minutes more. Transfer cookies to wire racks, and cool completely. 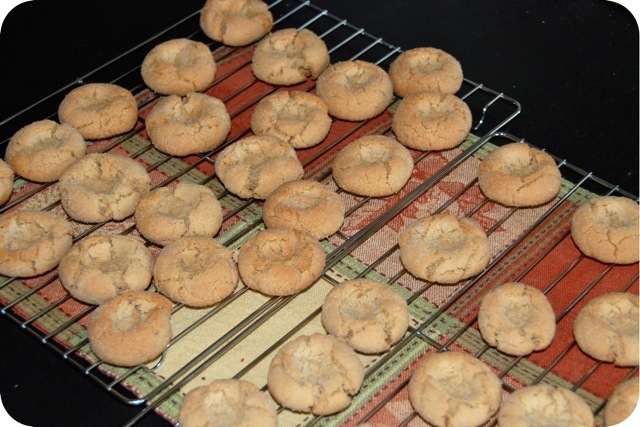 When cookies are cool, heat jam in a small saucepan, stirring, until loosened, about 30 seconds. Spoon about 1/2 teaspoon into each indentation. Let the jam set, then enjoy!